Do you consider yourself to be physically active? You probably are more active than you think. 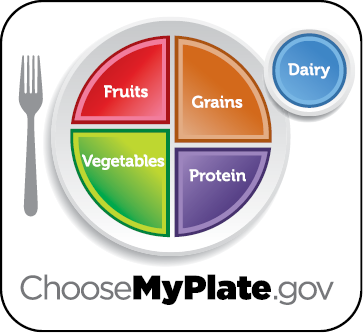 According to the MyPlate recommendations at www.ChooseMyPlate.gov, being physically active is “movement of the body that uses energy.” Calories are units of energy. You use up calories when you are active. The more time and intensity you put into an activity, the more calories you burn. Calories are units of energy. You use up calories when you are active. The more time and intensity you put into an activity, the more calories you burn. How many calories will a 154-pound man use if he walks 3.5 miles per hour for 30 minutes? The answer: “c.” He should expend about 140 calories during this time. To maintain current weight, the number of calories you take in from food and beverages every day should be equal to the amount of calories you use through physical activity and normal body function. Activities such as walking, gardening, climbing stairs and dancing all are good examples. Be physically active for at least 30 minutes most days of the week at a moderate or vigorous activity level. True/false: Golf is considered a moderate-intensity activity if you walk and carry your clubs. True/false: Basketball can be a vigorous activity if you play a competitive game and run up and down the court. The answers are both “true.” Other types of moderate activity can be gardening, dancing, hiking or light weight training. 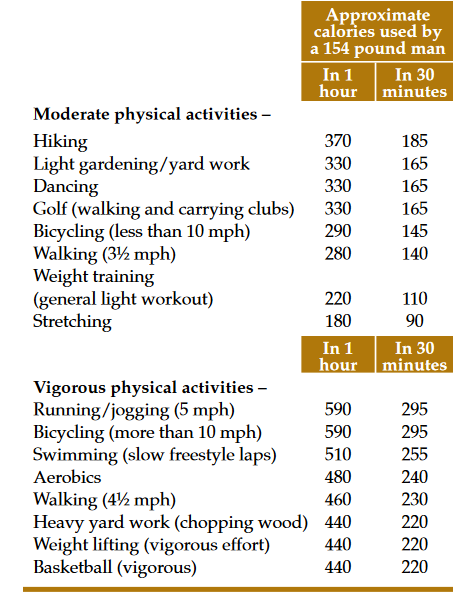 Vigorous activities are aerobics, swimming freestyle laps, chopping wood or running 5 mph or faster. To get the desired health benefits from physical activity, you should complete a minimum of 30 minutes of moderate or vigorous activity daily. Activities of lower intensity, such as walking around the grocery store or light housework, do not increase your heart rate enough, and therefore do not count toward your 30 minutes. You can accumulate the 30 minutes of recommended activity in three 10-minute segments throughout your day. Amounts less than 10 minutes do not have the same benefits. If you want to prevent weight gain, be active for 60 minutes. Being physically active for more than 60 minutes most days of the week even may help you lose weight. ▲ Walk to work. If you drive, park farther away and walk the rest of the way. If you ride the bus, get off a stop or two early. ▲ Replace a coffee break or part of your lunch break with a brisk 10-minute walk. ▲ Mow the lawn with a push mower, clean the house or hand wash your car. ▲ Stretch, ride a stationary bike or jog on a treadmill when watching TV. ▲ Walk the dog at a quick pace. This is good for both of you. ▲ Play with the kids outside by riding bike, raking leaves, building a snowman or going on a nature hike. Children and teenagers need physical activity, too. They should be active for at least 60 minutes almost every day. Encourage them to participate in a sport or other activity that will keep them active. ▲ Join a walking group with a friend or partner and walk around the neighborhood, at parks or the local mall. ▲ Join an office or community softball or bowling team. ▲ Take part in your work or community recreation center or gym. ▲ Participate in a yoga, dance or karate lesson. ▲ Start a family routine of biking or walking in the evening. Pushing the baby in a stroller is considered moderate exercise. The most important thing to remember when finding ways to be active is to do things that you enjoy and fit into your schedule. Find fun activities, such as swimming, downhill skiing or golfing, and incorporate ways to get the most out of the activity. Choose to make time in your day for the activity. How many calories does physical activity use? A 154-pound man (5 feet 10 inches) will use up about the number of calories listed doing each activity below. Those who weigh more will use more calories, and those who weigh less will use fewer. The calorie values listed include both calories used by the activity and the calories used for normal body functioning. For more information on the importance of becoming more physically active.